Wow, this watch is amazing! 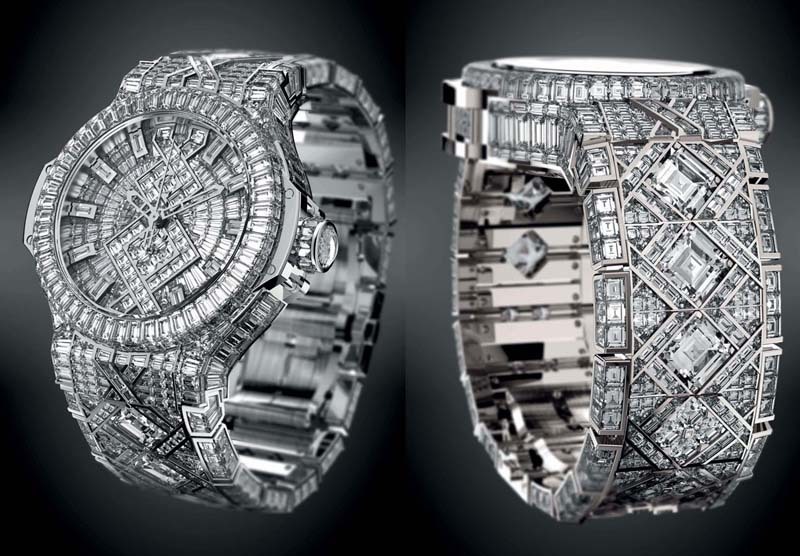 The watch designer Hublot, decks out this incredible watch, which has been named the “Big Bang” with 1282 diamonds! I feel it should have been named “The Big Radiant Magnificent” watch! The price? Only a whopping $5 million dollars, making it the most expensive watch for 2012 so far. The diamonds were carefully selected by Hublot and are all of the highest quality, graded A VVS in clarity and Top Wesselton in color, that is a rare white. It is rightfully claimed to be the most expensive watch in the world! In making the watch, diamond cutters started with a design and found diamonds that best matched the intricate construction of the watch casing, dial and bracelet of the piece. It took 12 specialist diamond cutters and 5 diamond setters, 7 months to complete this elaborate 27 carat watch! A watch retailer in Singapore called “The Hour Glass” owns it. This entry was posted in Jewelry, Jewelry News and tagged 5 million dollar watch, diamond watch, hublot watches, jewelry warehouse, world's most expensive watch. Bookmark the permalink.